These Vegetarian Stuffed Peppers are hearty, filling, healthy, and delicious! 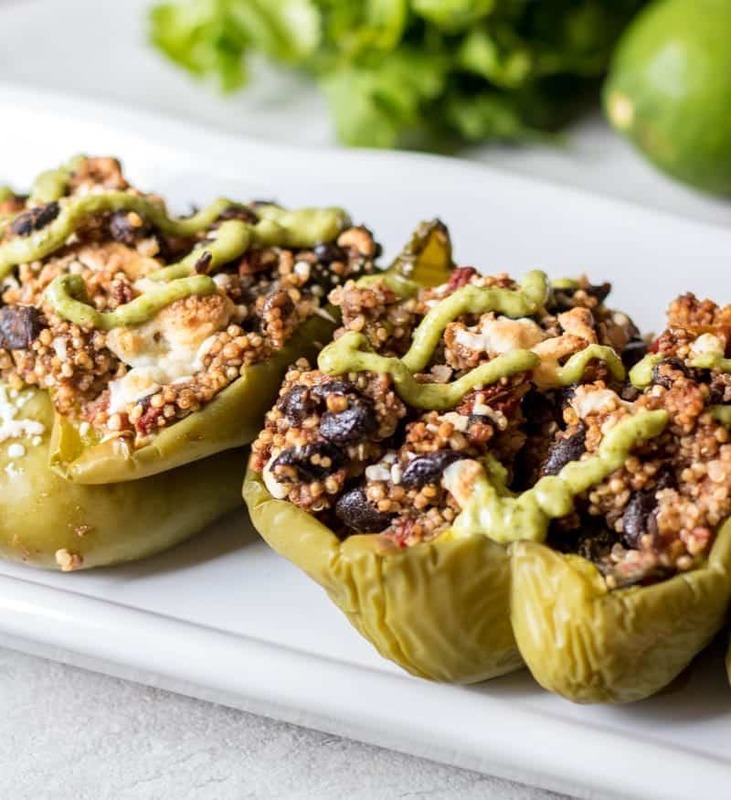 Made with seasoned quinoa, black beans and a bright avocado cream, these Easy Quinoa Stuffed Peppers have been given a Tex-Mex spin that is irresistible! If you are looking for more hearty Vegetarian Entrees, check out Easy Lentil Tacos, Slow Cooker Vegan Sloppy Joes, or Homemade Veggie Burgers. I grew up eating traditional stuffed peppers made with ground beef and rice. And while I loved the classic version, I prefer these Vegetarian Stuffed Peppers made with tex-mex spices. These Vegetarian Stuffed Peppers are not your average stuffed pepper. 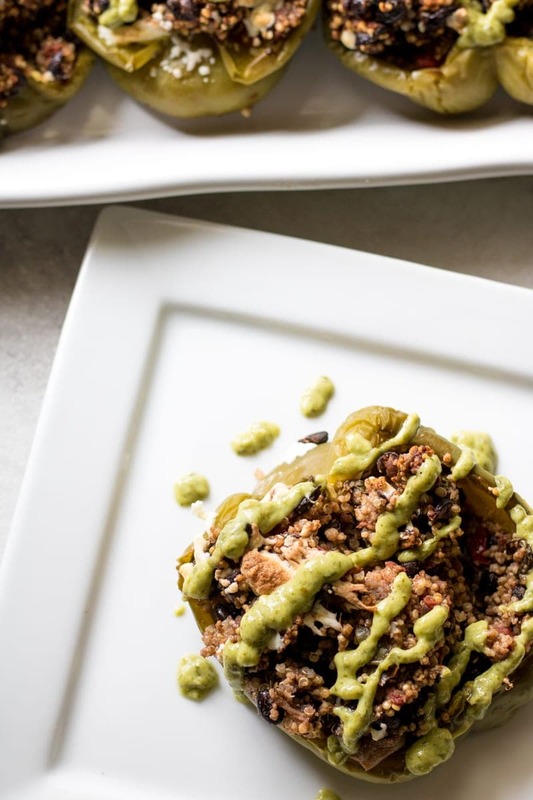 Green peppers are stuffed with a mixture of quinoa, black beans, fire roasted tomatoes, and taco seasoning then finished with a bright Avocado Lime Cream. They are just as hearty as the classic recipe made with ground beef, but they pack a punch when it comes to flavor and deliver a high dose of plant protein thanks to the quinoa and black beans. Even the meat eaters will love this easy vegan meal! In fact, I served Quinoa Stuffed Peppers to my dad who is known to oppose meatless meals. You want to know what his response was? The peppers did not have meat in them? They were so hearty and filling. In a large saucepan, bring stock, quinoa, tomatoes and taco seasoning to a boil. Reduce heat to simmer and simmer covered for 15 to 20 minutes. Add in black beans and mix well. Slice peppers in half and remove ribs and seeds. Place hollowed out peppers into casserole pan. Stuff peppers generously with filling (about 1/2 cup per pepper). Top with cheese if not vegan. Pour additional stock around stuffed peppers and cover with foil. Bake for 30 minutes or until peppers are soft and tender and filling is warmed through. Blend the avocado, lime juice, zest of lime cilantro, and water together until smooth. Feel free to use Instant Pot Quinoa to speed up the process of making these Quinoa Stuffed Peppers. Just mix cooked quinoa with taco seasoning, tomatoes, and beans before stuffing into peppers. I chose black beans to add these Mexican Stuffed Peppers, but pinto, red beans, or chili beans all work. You can choose to omit the beans as well. If you don’t have the ingredients to make the avocado cream, you can top these peppers with salsa as well or fresh chopped tomatoes and onions. In a large saucepan, bring 1 1/2 cups stock, quinoa, tomatoes and taco seasoning to a boil. Reduce heat to simmer and simmer covered for 15 to 20 minutes. Add in black beans and mix well. Place hollowed out peppers into casserole pan and stuff peppers generously with filling (about 1/2 cup per pepper). Pour remaining stock around peppers. Cover with foil. Bake for 30 minutes or until peppers are softened. In the meantime, make the Avocado cream by blending the avocado, lime juice, zest of lime cilantro, and water together until smooth. Serve peppers with Avocado sauce. If you are not vegan, these Vegetarian Stuffed Peppers are delicious topped with Colby Jack cheese before baking. This recipe looks great. The protein blend sounds amazing. I need to try it out. The blend is incredible Brandi, you really need to try it. Your clicks are so making me drool! Worth a try! I can already smell all the beautiful aromas of ingredients in your stuffed peppers and they looks great too! Another plus point is that they are nutritious, stuffed with protein rich ingredients. Wow! Love all that flavor. The avocado cream on top sounds absolutely amazing. Yum! I could enjoy this for Tex-Mex Tuesday every week! These stuffed peppers look amazing! So many great ingredients. The avocado cream puts them over the top! Thank you! I agree that avocado cream is a MUST have! I would have totally thought there was meat in here! Definitely will try! LOL!! That is exactly what my dad said—after eating it! These Tex-Mex peppers are the perfect weeknight dinner recipe. YAY~ happy to hear that! Made these for dinner and they were amazing! I especially loved the avocado cream. YAY!!! So glad you enjoyed the cream too that is my favorite.